"Can I heat style micro link hair extensions?" Ah, micro link hair extensions (also called micro loop hair extensions or micro ring hair extensions) are great. No glue or heat required to attach the hair extensions means they're kinder to your hair, but what about heat to style? Tongs, irons, the whole shebang? Is it bad for the hair, will you damage the bonds? Read on and you'll be in the know. The best way to think about using heat on your micro loop hair extensions is to think about how you would use heat on your natural hair: infrequently and a low setting... right? Right. You can use heated rollers, irons, tongs and crimpers on your micro loop human hair extensions but the key is to use them infrequently and at the lowest possible settings. Hmmm... just what is infrequent? Well once a week would be infrequent and every other day would be frequent. The fact is, you want to preserve your hair extensions and excessive heat will damage and dry out the hair. Always keep heat away from the actual micro rings as the hair extensions are bonded together with keratin (stick tip or I-tip hair extensions) and too much heat can cause these bonds to weaken and cause shedding of your hair extensions as well as matting around the bonds which means your natural hair will also become matted. As micro rings can contain metal, they can heat up with dryers and other heat styling tools. If you have wavy or curly micro loop hair extensions then overusing heat styling tools can distort or damage the texture as the hair has usually been processed for texture and so excessive heat styling damages the hair shaft. One way of preventing or reducing the impact of heat styling tools is to use heat protection serums and sprays on both your natural hair and your micro ring extension hair. Whenever you use heat styling tools on your hair extensions, don't over comb the micro ring hair extensions as this can cause the hair extensions to shed. If you have lighter coloured micro ring hair extensions, it will have been "lifted" to this colour (using bleach). Due to this, it's best not to use heat styling tools. If you feel you simply must, must, must use them, then use a thermal protection spray or serum to help reduce any damage. "Can I dye micro link hair extensions?" Human hair micro link hair extensions can be dyed but most specialists advise against this. In most cases, the hair extensions have already been dyed so repeated dyeing can damage the cuticles. If you do choose to dye your hair make sure that the dye doesn't come into contact with any of the bonds as it can affect the keratin in stick tip micro ring hair extensions (dip dyes may be a better option here). 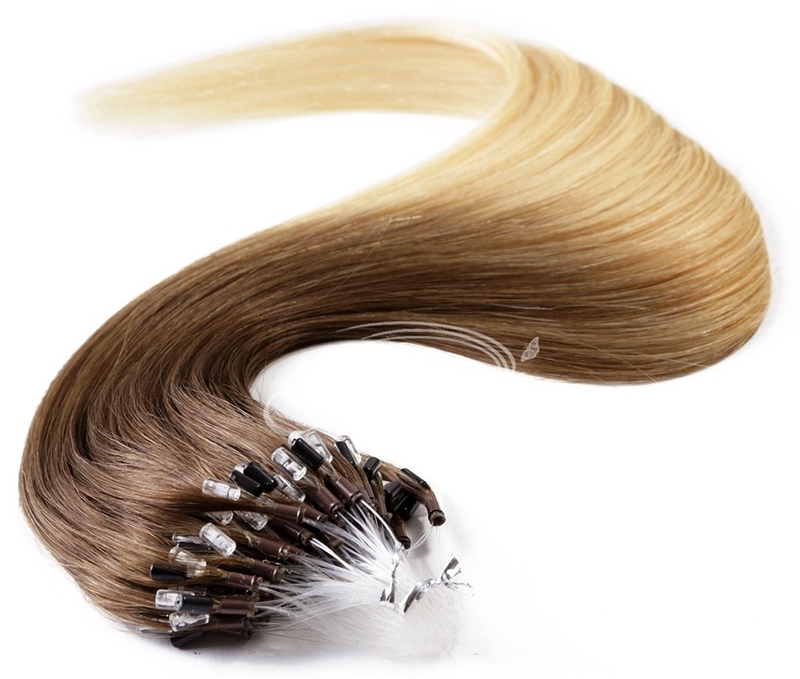 If you have multi-tonal hair extensions, the dye will not produce a single solid colour. As with all hair dyeing, it's always more predictable to go darker rather than lighter but if you want to dye the hair lighter, be aware that you may have to first lift the current colour. After dyeing the hair, it's important that the hair extensions are washed properly and sprayed with a leave-in conditioner or nourishing hair oil on the hair from mid-length down to the ends (don't put leave-in conditioner or hair oil on or near the micro loops as this can affect stick-tip (I-tip) keratin bonds). The leave-in conditioner or oil will help strengthen the hair after exposure to the dye. Make sure that the micro ring hair extensions have dried fully after washing and as always, never sleep with wet micro link hair extensions. As part of preparing your micro ring hair extensions for sleep, slowly and gently run your fingers across each of the micro rings to make sure that they haven't become tangled during the course of the day. "Can I chemically perm or straighten my micro link hair extensions?" The short answer is no. The texture of your micro ring hair extensions will usually have been achieved through chemical processing which automatically alter the structure of the hair; this includes straight texture micro ring hair extensions as well as wavy textured micro ring hair extensions and curly texture micro ring hair extensions. Any further chemical treatments will weaken the structure of the hair extensions even further and ultimately damage the hair extensions. Even if your micro ring hair extensions are made from "raw" unprocessed hair, it's still not advisable to chemically straighten or curl the hair as the chemicals can react with the bonding agent used for stick-tip (I-tip)the actual extensions (usually keratin). Speaking of chemicals, whilst you can play sports and swim with micro link hair extensions, perspiration, sea water and chlorine (from swimming pools) can also affect the bonds for micro link hair extensions. "Can I use hairspray and mousse on my micro link hair extensions?" Yes. Mousse, gel, serums and hairspray can be used, but they should not be used on or immediately near the actual micro rings as stick-tip (I-tip) keratin bonds can react with the chemicals and become sticky or loose which can cause your natural hair to become matted or cause the micro links to slip off your hair. If you want to keep up to date with the next guide about hair weave, hair extensions, wigs and hair pieces then join our blog, or check the Hair Extensions Q&A section.